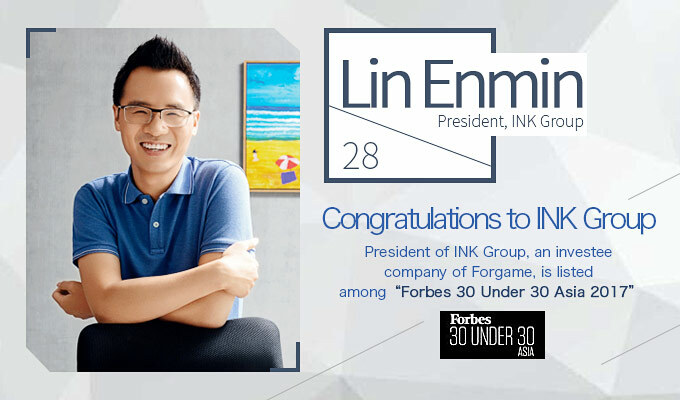 We are pleased to invite the public to join our hands to congratulate the Group's investee company, INK Group ("INK"), for its Co-founder, President and Chief Executive Officer, Mr. Enmin Lin is being listed among the Forbes 30 under 30 – Asia – Finance & Venture Capital this year. In 2016, Forgame entered into an investment agreement with INK in the form of an RMB300 million convertible bonds. Subject to the transaction terms and conditions, Forgame has the right to convert all or any part of the convertible bonds into conversion shares of INK. Assuming the conversion rights are fully exercised, Forgame will hold approximately 15.01% of INK's equity interest. INK offered its financial services products via the popular Jianlicai (简理财) app, which is widely recognized as a professional and safe financing solutions platform. INK has also built an effective network to attract quality borrowers to generate real-estate backed collateralized loans. INK was able to grow its transaction volume and revenue to RMB44.7 billion and RMB300 million in 2016 respectively. Specifically, Jianlicai (简理财), contributed RMB29 billion of transaction volume in 2016, which is 6 times of that in 2015. Mr. Dongfeng Wang, Chairman and Chief Executive Officer of Forgame, said, "We are very glad to witness the recognition of Mr. Lin by Forbes. The presentation of Mr. Lin on the list reaffirms his dedication in INK, as well as the Fintech Industry. We wish Mr. Lin and INK every success in the future, and we will explore more collaboration opportunities with INK in the future." Established in 2009 and listed on the Hong Kong Stock Exchange on 3 October 2013, Forgame Holdings Limited is a leading company of mobile games and webgames in China. Since its inception, Forgame has delivered hundreds of games to the China and overseas markets. Its game publishing platform 91wan has attracted over 200 million users cumulatively. In December 2016, the Group prepared for the commencement of Internet Finance business by obtaining a license from the government to carry out internet micro-lending business in the PRC. This press release contains forward-looking statements. These forward-looking statements can be identified by terminology such as "will," "expects," "anticipates," "future," "intends," "plans," "believes," "estimates" and similar statements. Such statements involve certain risks and uncertainties that could cause actual results to differ materially from those in the forward-looking statements. Potential risks and uncertainties include, but are not limited to, Forgame’s limited operating history, its ability to develop and operate new games that are commercially successful, the growth of the online/mobile game market and the continuing market acceptance of its games and in-game items in China and elsewhere, its ability to protect intellectual property rights, its ability to respond to competitive pressure, its ability to maintain an effective system of internal control over financial reporting, changes of the regulatory environment in China, and economic slowdown in China and/or elsewhere. Forgame does not undertake any obligation to update any forward-looking statement as a result of new information, future events or otherwise, except as required under applicable law. Forgame Holdings Limited(雲遊控股有限公司) - Incorporated in the Cayman Islands with limited liability Copyright © 2017 Forgame.com. All right reserved.